I'm interested in images of historical suspensions for swords and scabbards and other weapons from saddles. All times and places welcome. So far I can only find things like scabbards from the knight's belt in Mac Bible, Durer's engravings, equestrian sculptures, or cavalry baldrics, that sort of thing. And pistol holsters, but I am not as interested in that. Let's build a database. If you are into reenacting historical horsemanship what do you use? Only your own belt I suppose. But I would like to know about tack and so forth. Been lurking on here for a bit, but this post has prompted my first go at participating. In the past six months I've been getting back into riding after about ten years off, and coincidently getting back into the reenactment as well, so naturally the two have combined. I've just started building a saddle based on 13th century depictions so have spent a bit of time scanning through artistic representations. When using my modern western saddle, I often suspend my sword from the saddle pommel. It's just so handy. I haven't found much in the way of evidence for this practice historically though (noting the period I've been researching is the 13th and 14th C). Here are a few links to pictures I have found though. At first I thought these 'bundles' secured in front of the leg might be some sort of luggage stowage, but this image showing one from the front suggests something more defense oriented. Interested in hearing other interpretations of this though. This is the only image I've found showing a weapon suspended from the saddle, hung over the pommel as I sometimes do with my modern western. Worth nothing though is that the horse owner is not riding, he is enjoying a picnic with his lady friend. So when I finish my period saddle it looks like my habit of doing this will have to stop (unless I'm picnicking of course). I've linked to my pinterest gallery of tack depictions rather than manuscript miniatures in case it may be of some interest to you. Hopefully I've posted the links right. A very rare image of a Persian mace. 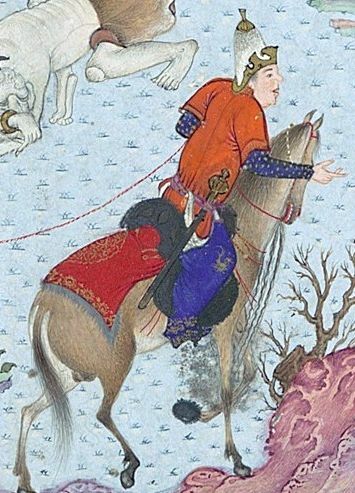 Persian flanged mace through the belt of a mounted warrior, detailed view.. "Tahmuras Defeats the Divs", Folio 23v from the Shahnama (Book of Kings) of Shah Tahmasp. Author: Abu'l Qasim Firdausi (935–1020). Artist: Painting attributed to Sultan Muhammad (active first half 16th century) Folio from an illustrated manuscript Date: ca. 1525, Met Museum. 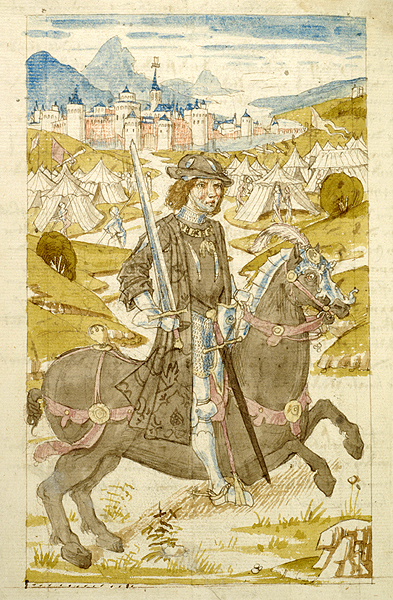 From what little research I have done, swords and other weapons being suspended from the saddle or other parts of the horse seem to be exceedingly rare in manuscript art. I do not recall ever seeing it in any of the 12th century images from Manuscript Miniatures, and I have spent about 40 minutes looking through the 14th century images. So far, nothing, save the same Peterborough Psalter already posted. I'd like to hazard a hypothesis why this may be. Most of the time, when we see knights and men-at-arms or mounted serjeants in manuscript images, they're in the midst of fighting. In such a context, having a weapon hanging or suspended from the horse makes no sense. Not only is it difficult to reach for the warrior, but it can also slap against the horses flanks which could irritate or spook the horse. Thus, if weapons were suspended from a horse, one would probably expect to see them on pack horses and palfreys. As neither of these kinds of horse are commonly represented in miniatures, it's difficult to find examples of suspension methods. From what little research I have done, swords and other weapons being suspended from the saddle or other parts of the horse seem to be exceedingly rare in manuscript art. I have the same impression... I can only think of one example offhand, and it is of a very late date. 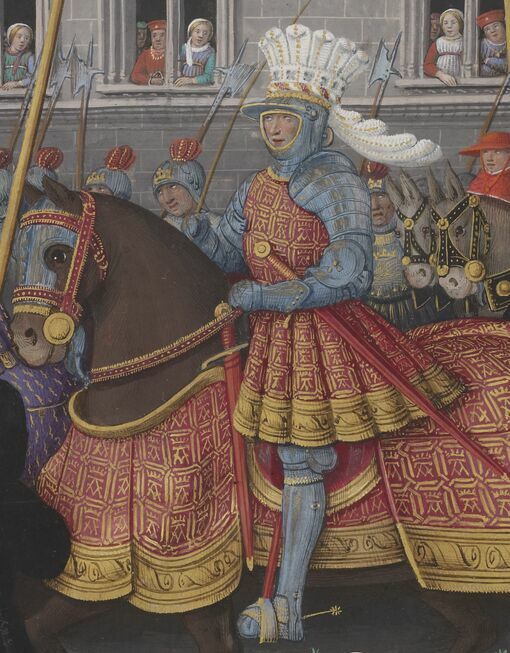 It is interesting though: the French king, Louis XII, is clearly shown wearing a longsword at his hip, with a shorter arming sword suspended from the saddle before him. I think it's significant that the context of this image suggests a parade, rather than a battle or siege. Displaying one's single-handed sword can be part of the extravagance of the event, yet it makes little sense in a situation where a conflict could be imminent. I've lost count of how many references in myArmoury threads and elsewhere I've found, of Medieval knights carrying arming swords from saddle to battle, or longswords from saddle to battle, with the other sword on their belt with never finding a single image to support this. If there is anything to the idea that an arming sword, or any sword, was a secondary weapon in any time, one would think there would be more to it. In any case, it's interesting there's no consensus whether the arming sword or the longsword was belted, and which was from saddle. So now I am a bit doubtful that swords were carried from saddles as much as people think. Where did people get this common idea of an arming sword being carried into battle from a saddle, or a longsword? Surely there are also some images of saber carry from the Napoleonic era of cavalry harness. The Towarzysz husarski carried underneath his left thigh an Eastern-derived koncerz estoc (up to 1.5 metres in length) and, often, a palasz (a type of broadsword) under his right thigh. The szabla sabre was carried on the left side, and several types of sabres were known to winged hussars, including the famous szabla husarska. 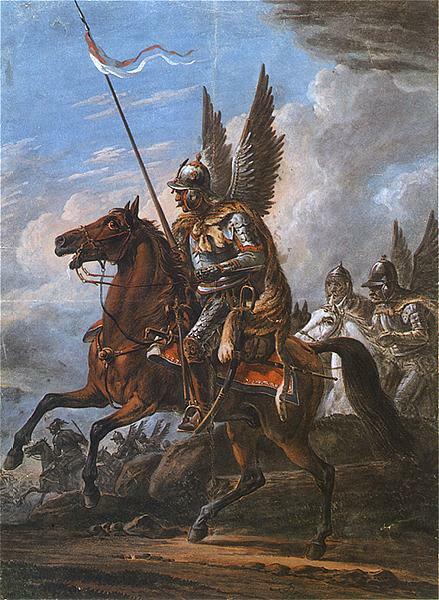 Winged hussars sometimes carried additional weapons, such as "nadziak" type of war hammers and battleaxes. Towarzysz husarski carried one or two wheellock (later flintlock) pistols in the saddle holsters, while retainers also might have carried a pistol or light wheellock arquebus or carbine; from the 1680s a carbine for retainers was mandatory. Would be interesting to know how these additional weapons were carried, in all times and places from mounted warriors. Hi Ed, welcome, happy to have you here. I ride horses somewhat often for my work, though it's a bit of hang on and go charge after renegade cow or sheep. I dream of being able to reenact something with knightly or hussar horsemanship, but it's hard for me to think of how exactly to do this with what I have available in remote US. Many good cowhorses and western tack. Nothing particularly 12-13th century, or 17th century as you might guess. Anyhow, thanks for the good words and images. The Psalter image is helpful since it's so early, but honestly it looks like the restful knight merely hung his sword belt from the saddle, not actually a rigging from the saddle. We've lost so much knowledge of using horses as our predecessors had. However, later in the same manuscript there is an image showing that the knights simply have sword belts that hang down substantially. 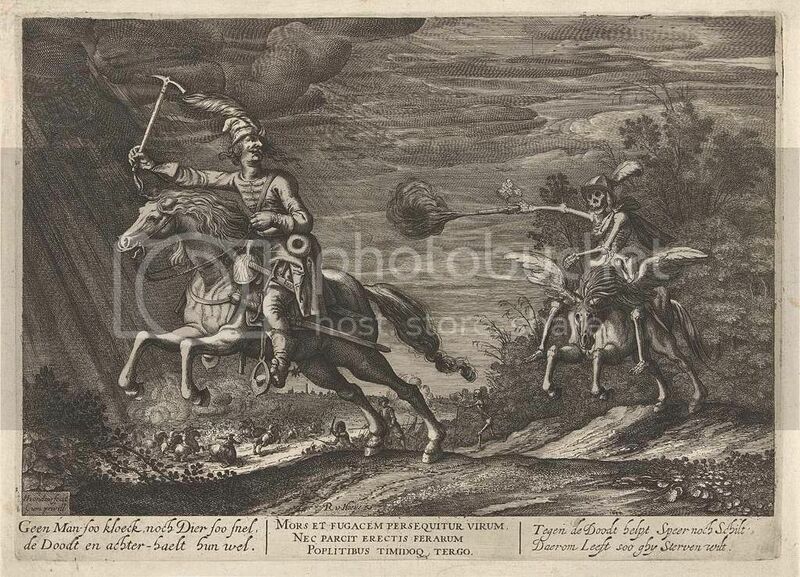 A 1644 print of a Croat or Hungarian horseman in Imperial service with a pallasch or possibly missinterpreted panzerstecher hanging from the saddle. Thread drift: the text on the left and right in italics is Dutch. I'd rather say the second text would state "...So live the way you want to die"
Found another example, this time in an illustration of Charles the Bold made c. 1490. No real distinction in size between the sword in hand (scabbard on the left hip out of view?) and the saddle-sword this time. It's presented as a battlefield/military camp scene, but is still basically an idealized portrait - not necessarily realistic. The King's Mirror in the 1250s recommended an armored horseman carry two swords, one of which would be hung from the saddle.